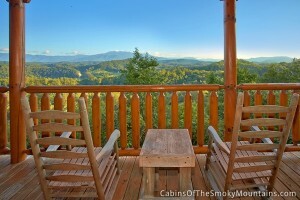 Here’s a great cabin in a great location in the Smoky Mountains. It’s Villa Pallazo, a 2-bedroom luxury rental cabin that sleeps up to 10 people. 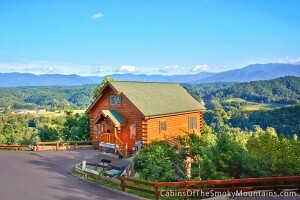 Located in Legacy Mountain Resort outside of Pigeon Forge, Tennessee, this is one of our many Pigeon Forge cabins. 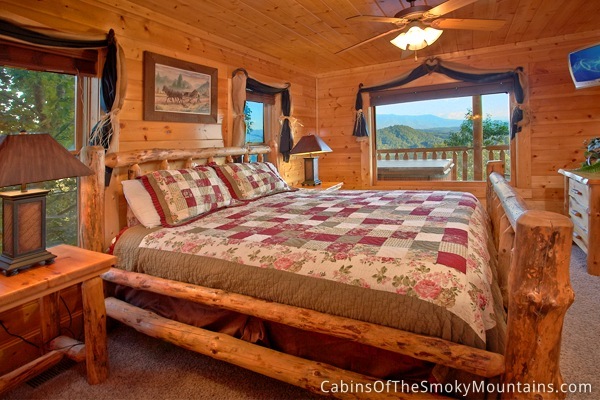 With 2 full bathrooms and 2 king bedrooms on 2 separate floors of this 3-story cabin, extra accommodation is provided with a queen sleeper and 3 queen futons, so the whole crew can come for a vacations stay, and there shouldn’t be TOO much fighting over who sleeps where! 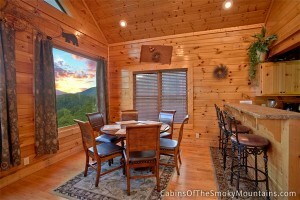 The great thing about a cabin versus a hotel room is the number of people who can comfortably stay in one. 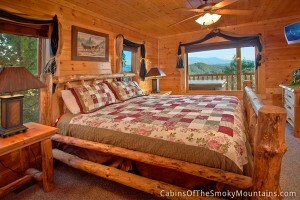 Most cabins will sleep more than their bedroom capacity, depending on the layout. And when the cost gets split a couple of ways between two couples, and friends and family, suddenly there’s no comparison with other lodging – you just can’t beat the savings. 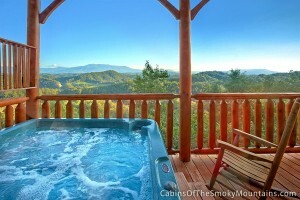 Besides, who wouldn’t want a deck and hot tub for ease of gazing at the stupendous views? 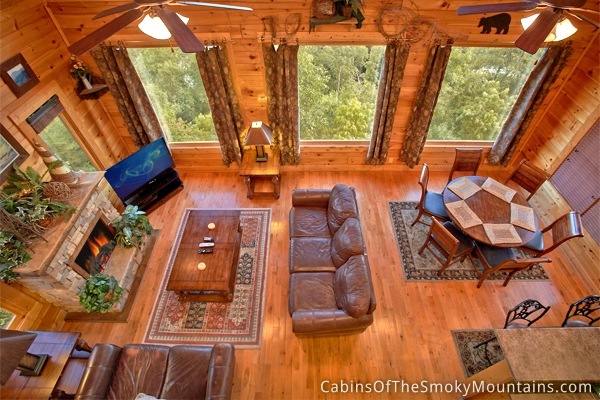 Not to mention a full kitchen inside, charcoal grill outside, washer & dryer, fireplace and numerous entertainment options, from the pool table to air hockey to Internet and cable, TV and DVDs. 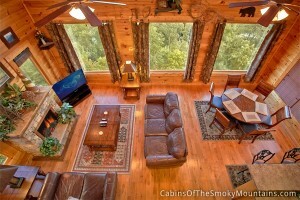 And some nicely sprawling, overstuffed couches to lie back on and contemplate life. Then there’s the view. 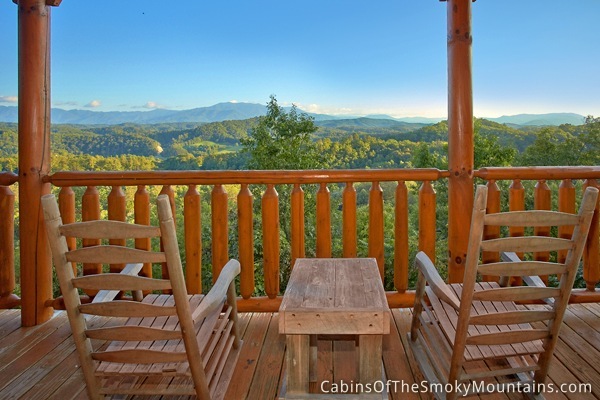 Villa Pallazo has spectacular views of Mt LeConte and the surrounding mountains. You could spend a lot of time just gazing, and breathing the air. Click here to check availability and book Villa Pallazo for your next trip!